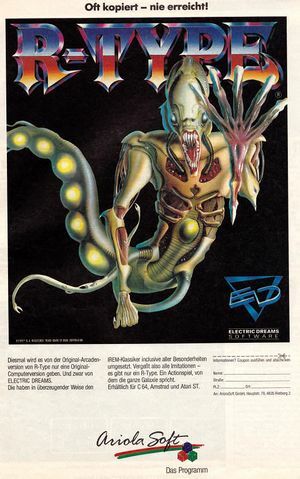 Information The pre-version R-Type Preview was started at Electric Dreams but was never completed. 8.5 The "engine" of "R-Type" and "Katakis"/"Denaris"
8.10 points at 42 votes (rank 68). At the start of the 22nd century the population of the earth has realized peace and wealth. And then THEY came. They came by an interdimensional pulse and descended on all types of lives, minerals and even electric devices. They were parasites and they rapidly multiplied. They have already completely destroyed the planets at the front and the earth is their next colonisation aim. They call themselves "Bydo". The only defence of the earth were up until now the "R-9" units, transdimensional hunters, which were equipped to attack the Bydo. None of them has ever returned. The last chance of the earth is, to send out the last R-9 that is left - equipped with a new weapon arsenal, that possibly could destroy the Bydo once and for all. With this wonder of technology YOU will try to intrude into the empire and to destroy the "heart of the Bydos". . .
"A desperate battle is fought in the endless and unknown dimensions of the universe, which are being contaminated and corrupted by an evil power. The evil power is the Bydo Empire, whose aim is the repression of the whole world. Its inhabitants are eerie creatures, whose direct sight already cause fear. But the humanity fights back and sends you to advance in an unimaginable highly modern spaceship, the R-9 fighter. Behind the control panel of this fantastic battle machine you are the last rampart of humanity against this enemy." A strange huge creature guards the entrance to another dimension. In another dimension you meet with living walls, scattered spurs and wild creatures, monsters that only consist of bones and organs attack the intruders. You encounter a giant battleship that cruises between different dimensions. Its navigation computer is controlled by the Bydo. Course: earth! You get to the remains of a fortress at the border to the realm of the Bydo. There are Bydo spurs everywhere. Fight through a world full of water plants. Imperishable dragonlike beings with huge tusks wait to attack you. Bydo ressources are transported to a recycling factory in a huge pipe system and guarded by hunters. Balls of concentrated energy fly around in slimy organic matter. The Bydo mercilessly defend their leader. Insert cassette into the datasette and press SHIFT and RUN/STOP simultaneously and then press the PLAY button on the datasette. The movement of your R-9 fighter is controlled with joystick or the standard keys. The weapons are triggered by fire button. A short press releases the standard weapon, when the fire button is pressed longer, the so-called beam shot is charged (a penetrating laser). The longer the fire button is pressed, the more energy is contained in the beam, by letting the fire button go it will be shot. The weapons are modified and improved by shooting a power armor, which releases different items that need to be collected with the R-9. the first item, that is released, is a special weapon, the "Force", that can be docked and disconnected at the front or the back of your R-9 by pressing the space button. The R9-Fighter is controlled by the joystick in control port 2. Space disconnect an connect the Force satellite. A pressing of the space button makes the Force module dock and disconnect. To shoot to the back you need to dock the Forbe module at the back of the R-9. Dock it at the front to be able to shoot to the front. The Force moduke can be upgraded in three stages by collection laser crystals. The properties of the lasers differ depending on what type of laser crystal you collect. If you don't dock the Force module to your R-9, then it will fire 3 or 5 shots when the R-9 uses its standard weapon, depending on the stage of extension. If you keep the fire button pressed, the energy of the beam will charge. The energy level of the canon can be seen in the beam display - the longer the display is, the stronger will the shot be that the canon fires. In the game you can pick up a variety of objects. Look out closely for formations and movements of the enemy, as they always repeat themselves at the same point. If your fighter is destroyed you start again at on of 2-3 fixes places in the level! Every end boss has a weak point. It flashes shortly when you hit it there. Every end boss has a special sensitivity for a certain type of weapon and its use (Beam, short laser impacts, etc.). Do not lose heart, play - play - play . . . 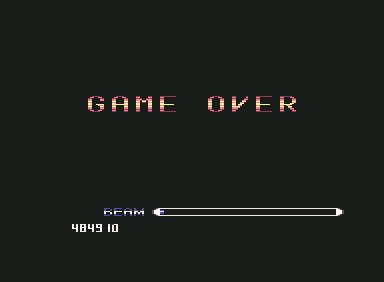 Entering SUMITA into the highscore list as a cheat does not work with the C64 version. Be careful, in level 1 when facing the end boss, you should defeat it before it starts to walk over the screen. 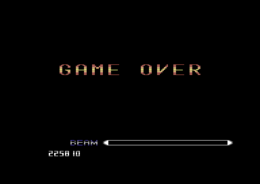 Logan: "Nice game, but Katakis is the better R-Type on the C64." H.T.W: "A bit simplified but nonetheless a very good conversion of the machine with the same name. There is nothing to critizise about the graphics, the music and sounds are excellent. The huge spaceship in stage 3 is probably legendary. Concerning the beam, there has a small mistake sneaked in: it destroys full formations of enemies, but when it meets a shot it just blows off. This makes using it with end bosses very hard, as they fire quickly. 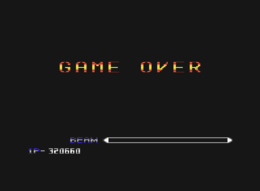 And some other inconsistencies such as the highscore list, that can be loaded from disk, but not be saved, and the two-player mode, that exists in the code but is not used in the original disk version might be atrributed to the time pressure during creation of the game. Not the best, but one of the best examples of this genre." Some cracks cannot be played to the end. More about this topic can be found on C64Games.de (see game links). 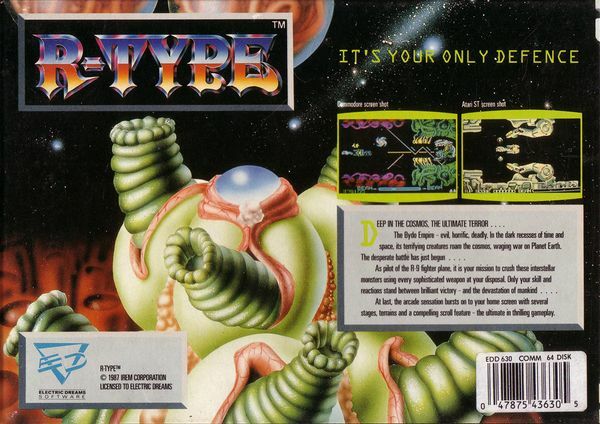 As all the cracks of R-Type are erroneous -as already mentioned, C64Games attended to this problem and could create a G64-Disk-Image of the original. It works only with the WinVICE emulator and can be played to the end (rare crash after the end sequence). Unfortunately, in the 6 1/2 weeks of development at Rainbow Arts they forgot to built in a highscore saver. Not even the code for it can be found in the game. For this problem there is also a solution on C64Games. The 2-player mode doesn't seem to work either. The code is present in the game, but it is missed out. In the IDE64-Patch by Arcane the mistake was eliminated. "While doing the R-Type realisation I had wished to have more time to program the game without mistakes and better at play." 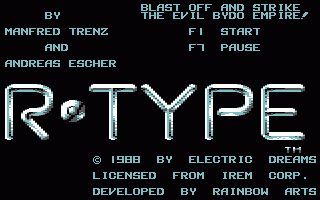 The "engine" of "R-Type" and "Katakis"/"Denaris"
The main frame of the program was also used before in Katakis with different graphics (levels) and music, according to Manfred Trenz. 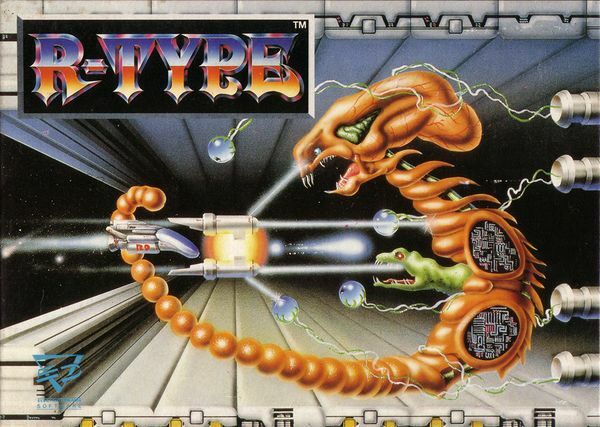 This was a reason for the time of development of R-Type. (see also posting in Forum 64) . 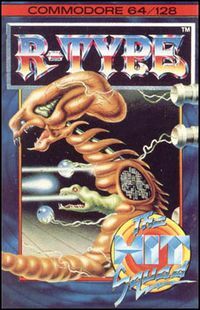 R-Type in the Killer List Of Videogames. This page was last modified on 20 July 2017, at 12:36.